Lower body exercises with the help of a stability ball help in training the lower back, pelvic and the abdominal muscles. These are one of the most difficult muscles to train. These exercises help in stabilizing the lower body muscles and build a strong core. Strong lower body is quite essential for balance, strength and power building. Using a stability ball for the purpose will help in toning the relevant muscles, will improve circulation and help in flexibility. These exercises are easy and can be done by beginner’s too. However, the intensity of the workout should be dependent on the comfort level. Start the exercises with your back facing the wall. You need to place the ball just between the lower back and wall. You should place your feet, at least two feet in front of your body. Now, keep your back in good contact with the ball. Slowly start contracting the abs and squat down a bit. Your upper thighs shall be parallel to the floor. Stay in this position for at least two seconds. You can again get back to the start position. Repeat the workout at least 10 times. You need to do the exercise in sets of 2 or 3. This is an easy exercise for beginners. 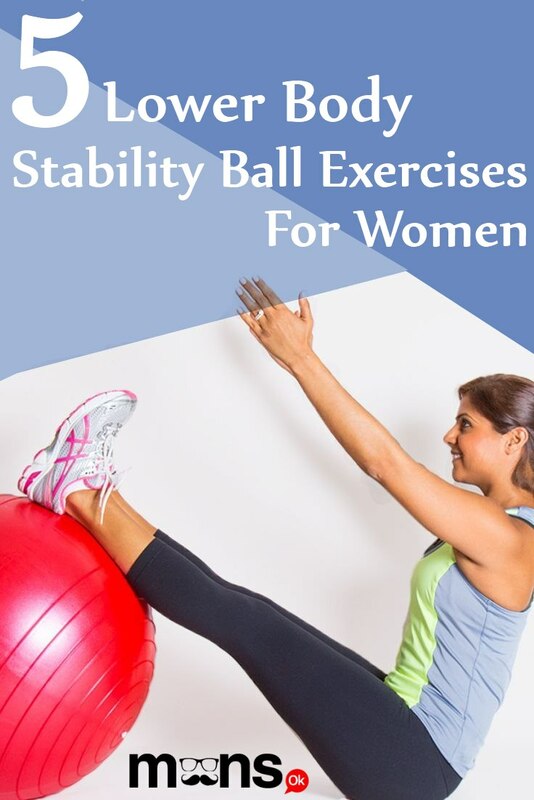 You will use a stability ball for the exercise. You can keep the core muscles engaged, which will work to challenge the hamstring muscles. Start the exercise by kneeling down on the ground. Your toes shall be tucked just under the feet. Your stability ball shall be in front. You will again place the forearms on this ball. Your arms shall make a 90-degree angle. You need to slowly push off from toes and then roll yourself a bit forward. You will be in a balanced position and in a plank like situation. You need to make a straight line from the head to heels. Stay in this position for a second. You can again bend the knees. You will then slowly roll back and get in the original position. You should repeat at least 10 times. One of the most problematic areas for women is the abdominal and hip region, where fat tends to get accumulated a lot. This exercise helps to reduce fat and tone the muscles. You need to start the workout by sitting on a swiss ball. Start walking your feet forward, till your lower back is on the ball. You can lie down back and then slowly stretch your arms, just above your head. You need to keep your feet flat and your knees shall be at an angle of 90-degree. Allow, your arms to slowly hang down. In case you start feeling a strong pain, you should immediately stop or you might hurt yourself. You need to hold on to this position for at least 10 seconds. Rest a bit and repeat the workout at least 3 times. This exercise works on the lower abdominal and back region. Start the workout by lying down as you rest your hips on the stability ball. Your toes shall touch the floor. Your feet shall be resting against the wall. Now, slowly place the hands just behind the head. Now, you need to squeeze the glutes and then lift the torso up so that your body is able to make a straight line. Hold this position for at least 2 seconds. You can again get back to the start position. You need to repeat the workout at least 12 times when you are starting. This is a really effective exercise for working out lower body muscles of women who need to lose fat and build strength. You need to start the workout in a plank position. Your hands shall be just under the shoulders. Your shins shall be placed on the ball, as you make a straight line from the ankles to head. You need to brace the core and do not let the lower back muscles to arch. Your shoulder pelvis muscles and feet shall be in a straight line. You will slowly move your left leg above the ball and then slowly lower it down. It shall be by the side and should lightly touch the floor. You need to again get it back to the start position. Your shin shall be on ball. You can repeat the exercise by your other side. You can continuously change the sides. You can press the ball with remaining leg. You can squeeze the glutes and then stabilize your body while your other leg is slowly moving.